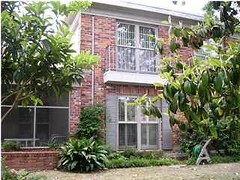 This McGehee Estates 2 bedroom, 2.5 bath condo is convenient everything! Spacious living and dining rooms, great galley style kitchen with solid marble countertops, a den/study and a powder room (1/2 bath)are all on the first floor. Upstairs you'll find a large master with great walk-in closet and a sitting room/den with pocket doors separating the two rooms. There is an additional guest bedroom and full hall bath upstairs as well. Great screened porch and big attached outside storage room. Lawn maintenance, insurance, and exterior upkeep of building included in monthly condo fee! For more information on this Montgomery AL condo for sale or other Montgomery real estate, give us a call at 800-428-5239. Be sure to visit our website, HatTeam.com.